DYNAMIC DESIGN This Dynamic design has a fastback look in back why it is referred to as a crossover coupe. You will notice who rakish it is, integrating Mitsubishis new design language throughout. The front end greets you with a sharp edged face in chrome finish, leading towards a tall, but sleek side profile to the fastback rear end. The liftgate is broken up with two glass panes and wrap-around taillights finishing off the Eclipse Cross design. LED lighting grace both ends of the Eclipse Cross, along with additional aerodynamics to keep the air flowing all around. The dual spoilers in the rear keep the Eclipse Cross grounded, even if it climbs a rough path towards the cabin on the lake. The SUV is balanced with solid ground clearance to keep the Eclipse Cross on track, even on uneven surfaces. EQUALLY DYNAMIC INSIDE Following the bold exteriors shape and lines is a functionally advanced interior. In fact, it is an all-new design never seen on any Mitsubishi before. The cockpit design wraps the driver around giving him or her full control and view of all functions. The instrumentation is made clear for the eyes at quick glance. Controls are within a fingers touch made easier to understand and use. The infotainment interface sits on top of the instrument panel as a tablet-like screen. Also new is the interface itself easier to view and operate as a touch screen, along with other controls nearby. Apple CarPlay and Android Auto compatibility adds to this system, along with eyes-free controls via Siri and Google Assistant. Available on the Eclipse Cross is a heads-up display, making your most important readouts available at eye level while you drive. Expect everything to be of a higher quality than before everywhere you touch, sit or feel are all designed to match the best in the class. All of this with versatile seating for five and expandable cargo space. A new edition to the Eclipse Cross is Mitsubishi Connect. This new telematics system enables you to get assistance in an emergency or through Roadside Assistance without having to dial a number on your phone. Plus, an app on your smartphone can remotely control your vehicles door locks, climate or enable Parental Controls for that assurance in helping your teen driver become a better one on the road. NEW POWER, NEW CHASSIS For the first time in a Mitsubishi SUV, a turbocharged engine is available standard on the Eclipse Cross. This 1.5-liter unit has 152 horsepower and 184 pound-feet of torque available with solid drives on the highway and around town. This new engine is actually more flexible across the rev band than our 2.0-liter and 2.4-liter four-cylinder engines, including a greater low end performance for better traction and passing maneuvers. Connected to this new engine is available Super All-Wheel Control (S-AWC), giving the Eclipse Cross exceptional traction in any condition year-round especially here in Minnesota. This system integrates the electronic 4WD system, Active Stability Control (ASC), Antilock Brakes (ABS), and Active Yaw Control (AYC) for greater stability on the road on any surface. THE SAFEST MITSUBISHI YET! On smaller SUVs, active safety can be seen as an afterthought. Not on the new Eclipse Cross. This new SUV offers the following features as available: Blind Spot Warning (BSW) and Lane Change Assist (LCA), Rear Cross Traffic Alert (RCTA), Forward Collision Mitigation (FCM), Lane Departure Warning (LDW), Adaptive Cruise Control System (ACC), Multi View Camera System, and Automatic High Beam (AHB). GREATER VALUE Pricing for the 2018 Eclipse Cross starts with of MSRP of $23,295. Trim levels available are the value-leader ES, the sporty LE, the popular SE and the luxurious SEL. The all-new 2018 Eclipse Cross is arriving soon at White Bear Mitsubishi. Dont worry, it will not replace any of your favorite SUVs. In fact, it will be sold alongside of them The new Eclipse Cross fits right in-between the Outlander and Outlander Sport. Contact us to let White Bear Mitsubishi know that you want to be first to get the all-new Eclipse Cross in the USA. We are as excited as you are to get this all-new addition to our family of new cars. Thank you for your interest in one of Walpole Mitsubishi's online offerings. 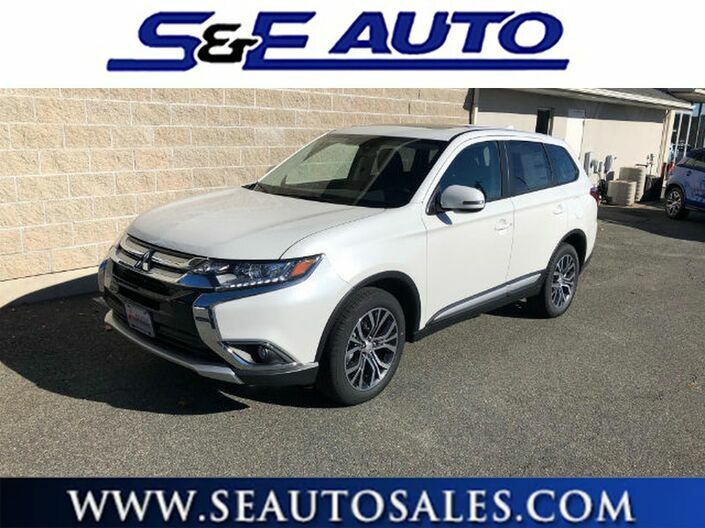 Please continue for more information regarding this 2018 Mitsubishi Eclipse Cross ES with 5mi. This SUV gives you versatility, style and comfort all in one vehicle. This 4WD-equipped vehicle will handle majestically on any terrain and in any weather condition your may find yourself in. The benefits of driving an Four Wheel Drive vehicle, such as this MitsubishiEclipse Cross ES, include superior acceleration, improved steering, and increased traction and stability. You don't always know the details about a vehicle's past. This time you will have the service records to clue you in to how well it was cared for. If you are looking for a pre-owned vehicle that looks brand-new, look no further than this White Mitsubishi Eclipse Cross. When all factors are equal, choose a vehicle equipped with a factory warranty like this gently driven gem.